The downward spiral of honeybees and native pollinators is serious. We are keeping one eye on media reports and one eye on our garden, hoping for sightings. 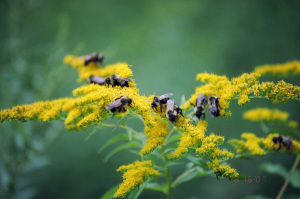 We used to be visited regularly by feral honeybees – they announced their grand entries with buzzing you could not ignore — but we have missed their song these past several years. Meanwhile we have planted varieties of native plants to attract honeybees — and their partners in pollination. These have arrived: butterflies, wasps (harmless), bumblebees, solitary bees. We have a succession of bloom through spring, summer and fall, so it is a joy to “follow the buzz” as new plants begin to flower. For updates and information, check out our posts listed below.